Pro-Ject RPM1 Carbon review | What Hi-Fi? The first Pro-ject RPM1 Genie appeared five years ago and wowed us with its adventurous styling, strong value and fine sound quality. Four generations on, Pro-Ject has developed the original into a high-tech package, which is still selling for sensible money. The big news here is the inclusion of an ‘S’ shaped carbon fibre arm with aluminium core, and an effective length of 21.8cm. Such technology is rare, even at high-end prices, so it’s astonishing to find it included on a relatively low budget product. The benefits of carbon fibre are claimed to be low mass, high rigidity and good internal damping – all desirable qualities in a tonearm. This isn’t the first time Pro-ject has included this material on a record player at this level though. It already makes the Debut Carbon, but the arm included in that package has a completely different design, right down to the bearing housing and bias arrangement. 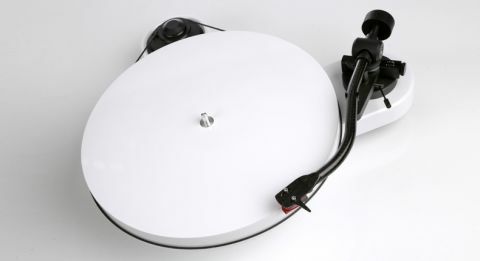 Pro-Ject supplies the RPM1 with cartridge fitted. It’s an Ortofon 2M Red moving magnet, which would cost around £80 if bought separately. It’s a proven performer that makes a fine partner for this deck. Other engineering highlights include the use of a stand-alone motor unit that sits separately from the main chassis to minimise any unwanted mechanical energy being fed into the main turntable structure. There’s also an inverted main platter bearing that uses a ceramic ball to reduce rumble noise. Set-up is easy. The cartridge is already fitted and aligned, leaving just the counterweight and bias to be adjusted. Make sure you place the turntable somewhere level and rigid, ideally as far away from the speakers as possible. This is a simple deck with little in the way of isolation from its environment, so this kind of care will pay dividends. The RPM1 comes in a choice of three colours (black, red or white) and makes a strong style statement. We like its minimalist appearance, though the finish on our sample showed up dust pretty quickly. We have no issue with the cosmetic quality, but there are areas that concern us. On initial start up, the motor emitted a low-level, intermittent clunk sound every few seconds, but this went away after a weekend of running. The arm bearing showed a bit of free play, which, along with an insubstantial feel to the lift/lower lever, reduces the feeling of quality. Play something demanding such as Holst’s Mars and this package does a good job. We’re happy with the Pro-Ject’s balanced tonality and refinement. There’s an impressive amount of detail on show, and it’s rendered with a pleasing degree of precision. The deck’s agility and its ability to convey nuances are commendable too, and we like the RPM1’s clean, open presentation. On simpler music in particular, the clarity is terrific. It’s not all good news, though. The sonic presentation isn’t as composed when things become complex, and it starts to sound a little disorganised when pushed. The package also lacks some authority when delivering large-scale dynamic shifts, making the music sound gentler and less exciting than it should. REM’s Automatic for the People reinforces this impression. The turntable delivers a wealth of information, though the sense of composure falters as the music’s complexity rises. High frequencies are incisive and articulate while bass is nicely taut and delivered with a decent amount of power. Yet, we could do with a bit more drive and attack. There’s drama in the music, but this Pro-ject doesn’t quite manage to access it. Project has a brilliant track record when it comes to sub-£500 record players. The RPM1 is less rounded in ability than we hoped, but still has enough in the way of sonic talent to earn consideration. If the style appeals it’s worth a listen.